To celebrate fifty years of Spider-Man, Dorling Kindersley present Spider-Man Year By Year: A Visual Chronicle. This massive Marvel tome is filled with details of Spidey’s most important stories. I planned the book out and split the writing duties with the spiderific Matthew K. Manning. It was great to reread so many classic Spidey stories as I researched the book, carefully selecting the key issues and storylines with Matt. The book starts with the ideas that influenced the webslinger’s creation and finishes with the anniversary issues. 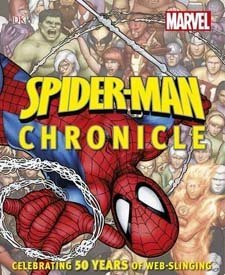 It also features bios of all the great creators associated with Spidey’s adventures and looks at how the webslinger has changed with each passing decade.